The north Norfolk coastal parish of Stiffkey is situated to the east of Warham. Its name comes from the Old English for ‘tree-stump island’. The parish has a long history, and was certainly well established by the time of the Norman Conquest, its population, land ownership and productive resources being detailed in the Domesday Book of 1086. The earliest datable evidence of human activity comes in the form of a few Mesolithic flint tools, including axeheads (NHER 1867 and 12478), a bladelet (NHER 12749) and a scraper (NHER 34753). Neolithic flint finds are axeheads (NHER 12751, 12752, 16751, 21707 and 25951), polished axeheads (NHER 15324 and 25276), a flake (NHER 12753), a scraper (NHER 14018), a blade (NHER 25952) and a quern (NHER 12744). A scatter of Neolithic flints (NHER 34754) noted in 1999 to the west of Stiffkey village could be a flint-working site. Analysis of aerial photographs has led to the tentative identification of the earliest structures. In the south of the parish, the cropmarks of a large concentric ring ditch or hengiform monument (NHER 27074) of possible late Neolithic to Bronze Age date are visible from the air, as are the marks of a possibly Bronze Age ring ditch (NHER 11326) located on the lower slopes of a valley overlooking a tributary of the River Stiffkey. Warborough Hill (NHER 1863) is a very degraded and mutilated ditched round barrow of Bronze Age or Iron Age date. Excavations there in 1934 revealed a Roman rubbish pit and Iron Age and Roman pottery fragments. The remains of a possibly Roman wall were noted in 1985 (see NHER 1865 and below). Bronze Age finds include some flint scrapers (NHER 1857), pottery fragments (NHER 12745) and two hoards of copper alloy axeheads (NHER 1858 and 22306). Iron Age finds are currently limited to pottery fragments (NHER 1864, 11327, 15088 and 22306), although aerial photography has identified the marks of possible Iron Age to Roman field boundaries (NHER 31440) and enclosures (NHER 27737). The remains of a Roman building (NHER 1867) were found in 1972 on Long Meadow. Subsequent investigations have recovered a range of objects, including large quantities of Roman coins, pottery fragments and a brooch. Numerous medieval and post medieval items have also been found. Roman pottery fragments and Roman building material (NHER 1865) are recorded as being found near Warborough Hill since the 1930s. A stretch of flint and mortar wall was thought to be Roman in date but is more likely to be medieval. The raised location of the site has led to suggestions that there may have been a signal station or watchtower here in Roman or medieval times. Possibly Roman enclosures (NHER 11325, 11717, 13076 and 38628) have been identified from aerial photographs. Other finds of the period include a large quantity of pottery fragments (NHER 1867, 12753, 12754, 17703 and 31572), coins (NHER 1867 and 17703), a coin hoard (NHER 1866) and a pendant (NHER 1867). Saxon finds are pottery fragments (NHER 23387, 30414, 30712 and 31572) and a brooch (NHER 25149). Old oak timbers (NHER 1872) found in a dyke on reclaimed land in about 1800 were at first interpreted as part of a Late Saxon ship, but could also be the remains of a post medieval watermill marked in the area on a map of 1586. The medieval period has left the parish with its oldest surviving building, the church of St John the Baptist (NHER 1887), a mainly 14th and 15th century building, consisting of a west tower, north porch, nave and chancel, the nave embracing the earlier tower. The church was heavily restored in 1848. Inside are many important memorials to the Bacon family. To the east are the demolished remains of St Mary's medieval Church, now just an earth mound. The remains of other medieval buildings include the standing and buried remains of the moated site of Hale's Manor (NHER 1886), as well as associated earthworks including fishponds situated alongside a tributary of the River Stiffkey. Extensive but mostly incomplete outlines of the flint and brick 15th century manor on a partly moated platform have been surveyed beside earthwork remains of adjacent moated enclosures. Earthworks of a late medieval or early post medieval formal garden have also been recorded. To the east of this the cropmarks of Rooks Wood Way (NHER 11718), a medieval to post medieval trackway are visible on aerial photographs. The road is marked on a map of 1600 and was formerly Rokeswode Way. 1 Church Street (NHER 12738) is the site of a medieval guildhall, marked on a map of about 1600. The present flint and brick cottage is probably 17th century with an 18th century addition to the east. Medieval objects recovered include pottery fragments (NHER 23387, 30712 and 31572), part of a jug (NHER 1868) and a jar (NHER 1870), coins (NHER 1867 and 16201) and buckles (NHER 31572). There are far too many post medieval buildings of interest in the parish for each to be described in detail here. However, the brief overview that follows takes a route from St John’s Church (NHER 1887) down Church street, then left onto Bridge Street, then back up Bridge Street and left onto Wells Road. Stiffkey Old Hall (NHER 1883), standing in eight acres of gardens (NHER 30488), is a remarkable flint, brick and stone house, dating from 1576 onwards, with additions and alterations in the 17th century (the gatehouse is dated 1640) and 18th century, and restorations in the 20th and early 21st centuries. The hall was built on the site of earlier halls for Sir Nathaniel Bacon, with financial (and possibly design) help from his father Sir Nicholas. It was originally intended to be a four-sided building symmetrically placed around a courtyard, but some parts were never built and others were later demolished. Of the U-shaped structure that stood originally, the west or kitchen range and part of the hall range survive, having distinctive round towers at the northeast, northwest and southwest angles. After several changes of hands in the last hundred years or so, the house is currently being restored. South of the Old Hall, over the river, is Old Hall Farm (NHER 18139), where a range of barns are thought to be the 17th century service court for the Old Hall. On the other side of the street from the Old Hall is the Old Rectory (NHER 47264), a two storey flint and brick former rectory of about 1730, enlarged and re-faced in about 1840. Further down on the left are numbers 8,10 and 12 Church Street (NHER 46682), an early 19th century two storey flint and brick terrace of cottages, which is a re-fronting and conversion of part of a 16th century barn belonging to Great Yard House (see below). Across the street is number 1 (NHER 12738), on the site of the medieval guildhall (see above). Turning onto Bridge Street, numbers1,3 and 5 (NHER 23387) are a complex flint and brick house, originally a 16th century single storey building with an attic, to which a large parlour block was added in the early 17th century. The older block was heightened in about 1700 and various additions made in about 1800. Numbers 9 and 11 (NHER 47822) are a pair of two storey flint and brick cottages. Number 13 (NHER 47513) is late 18th century, number 15 (NHER 47637) dates to 1840 and number 17 (NHER 47498) is early 19th century. Opposite is Vale House (NHER 19359), a 16th century two storey flint and brick house, to which a front block was added in about 1840 when the older house was encased. Number 19 (NHER 46648) is mid 19th century. Number 21, Lodge Farm House (NHER 12741) is a late 16th or early 17th century house with a rear projection containing cellar and stairs and traces of a removed porch tower. It was extended north and south, possibly in about 1700. Other additions and alterations were carried out through the 18th to 19th centuries. A vaulted underground structure, possibly an 18th century plunge bath, was uncovered in the back garden during works in 1988. Number 24 (NHER 47447) and number 26, Apple Cottage (NHER 47514) are both 18th century. Going back up Bridge Street and turning left onto Wells Road, on the left is Great Yard House (NHER 12740), a 16th century two storey flint house, L-shaped in plan, much restored and rebuilt, including a modern addition in Gothic style. To the north of Great Yard House is an 18th century barn (NHER 47825). Numbers 4 and 6 (NHER 47265), 25 (NHER 47676), 27 (NHER 47266) and 35 (NHER 47340) are all also 18th century. Down a long driveway is Warborough House (NHER 47499), a two storey free-standing gault and red brick neo-classical house of about 1830 with a north wing and service wing, forming a U-shaped plan court at the rear. Further along Wells Road, off to the right are 1 and 5 Muckledyke (NHER 46647), a 17th century two storey flint and stone house with later additions and alterations. Extensive analysis of aerial photographs has identified a large number of post medieval features, including sea defence banks (for example NHER 27139, 27140, 27147 and 27148). A very rare World War One circular concrete pillbox (NHER 23980) survives on the southern edge of the salt marsh north of High Sand Creek Caravan Park. More extensive World War Two anti-invasion defences covered the Norfolk coast after 1940, and can be seen on aerial photographs of the time. In Stiffkey, these included pillboxes and military structures (NHER 12742 and 27757), an anti-aircraft army camp (NHER 12747) and gun emplacements (NHER 27763). 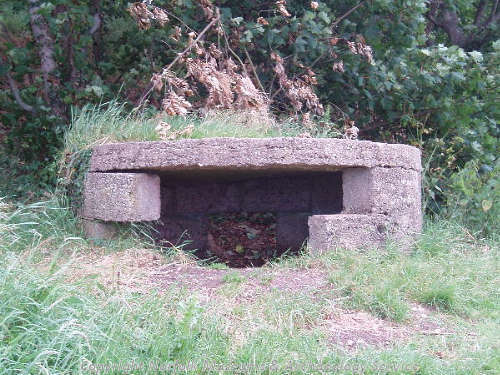 Most of the defences were cleared away after the war, but some remain, including a pillbox (NHER 12742). The cropmarks of two former searchlight battery sites (NHER 12849 and 33696) are visible from the air. P. Aldridge (NLA), 27 July 2007.